Deputy political bureau chairman of Hamas Dr. Mousa Abu Marzouk has denied press reports that said his movement was relocating out of Syria and that it has severed relations with Iran. He told Quds Press on Wednesday that the reports were media speculations and contrary to the facts on the ground. The Hamas leader said that he was speaking to Quds Press from Syria and no change has occurred to the movement’s presence in it. He added that Hamas did not sever relations with any party including Iran. Political bureau member of Hamas Ezzet Al-Resheq has reiterated similar statements, denying that Hamas leadership was leaving Syria and stressing that it was and still is working from Syria. I made it clear to Abu Mazin, Hamas is a terrorist organization, No statehood unless Hamas comes to terms. Salafi movements achievement in Egypt’s elections was a surprise to Washington, it is one of the topics he will discuss with Israeli officials. We must not cling to past. In the light of changes in the region we should share information and estimates, coordinate with our strategic partner, Israel, and think about how we move forward. Direct negotiations is the only way to have a Palestinian statehood. After meeting King Abdullah of Jordan, Feltman came to Jerusalem and Ramallah «to examine how to launch direct negotiations between Israel and the Palestinians. Reconciliation between Fatah and Hamas would not be achieved, because the deep divides remain unchanged, they represent an obstacle to genuine reconciliation. Feltman I made it clear to Abu Mazin, Hamas is a “terrorist” organization, No statehood unless Hamas comes to terms. Syria is wanted for its support to Resistance. Hamas was elected, (mainly, because it is a resistance movement) to stop selling out Palestine. As Khalid Amayere said about MB, Hamas also can’t take people’s support for granted. Hamas is a member of Palestinian factions based in Syria, and is not fool to sever its relations with damascus based faction, for reconciliation with Abbas. A fool would think Tantawi and MB may achieve what Mabarak, Omar Suliman, Siege, war and Sultan erdugan failed to achieve. So far the the consiparcy on Syria failed, and in the worst case, the pre-assad regime (God forbid) shall be a MB regime. So why leave Syria. In response to a question on the results achieved by the Salafi movements in Egypt, which won about 20 percent of the vote in the first round of elections, Feltman acknowledged that that the results was a surprise to Washington, noting that election results is one of the topics he will discuss with Israeli officials. There are between us and them excellent coordination and partnership strategy, and in the light of changes in the region we should share information and estimates and think about how we move forward. We must not cling to past. 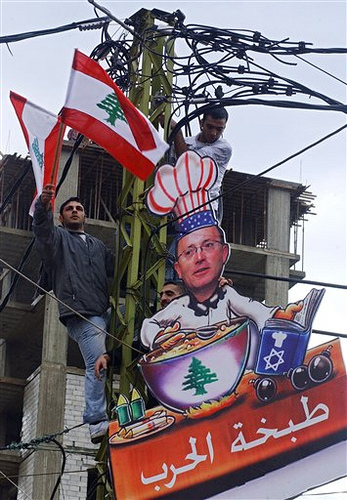 Turning to Hizbollah, according to Yediot Aharonot, Feltman was totally different, unlike diplomatic approach towards about brotherhood in Egypt, the former US Ambassador in Beirut, explained that they don’t deal with Hezbollah being a “terrorist” organisation who participated in the elections, and when they don’t like reality, they are imposing their wishes by force and violence. Feltman in recent days made a regional tour that included both Jordan, Ramallah and Jerusalem, where he met with King Abdullah and President Mahmoud Abbas and Israeli officials, including Foreign Ministry Director Ravi Barack and the leaders of Israeli National Security Council. For unclear reasons Feltman did not meet with Israeli Prime Minister Benjamin Netanyahu, but he said he had not requested such a meeting. The newspaper said that Feltman knows very well the Israeli-Palestinian conflict, noting that he had worked in the past at the US Embassy in Tel Aviv and served as US Consul General in Jerusalem. Feltman said he came to Jerusalem and Ramallah «to examine how to launch direct negotiations between Israel and the Palestinians, because that is the only way to reach the two-State solution», he confirmed the US position saying «we make it clear to the Palestinians that there is no shortcuts but direct negotiations, and in going to the United Nations Palestinians would not get a State». According to Feltman, President Barack Obama believe that security is the most importent matter most for the Israelis, while the goegraphy is main issue for the Palestinians, In this context “mediation should be activated to overcome the crisis of confidence between both sides, serious work is needed. The US Administration has also disappointments in this topic. I hear your claims that the Palestinians do not address security issue seriously, and on the other side I hear Palestinians claming that you are not serious, about geograhy. Therefore, President Obama spoke about the limits that must respond to the needs of the Palestinians but they see how the land is shrinking because of the settlements and outposts.